Ever find yourself on a singlespeed wishing you had one extra (low) gear for that single steep hill that makes your commute to work more difficult than you want it to be? This question is not a new one. Well over one hundred years ago, the problem was solved by the invention of retro direct gearing. In a nutshell, retro direct drives use two singlespeed freewheels, one small (high gear) and one large (low gear), mounted on the drive side of the rear hub. 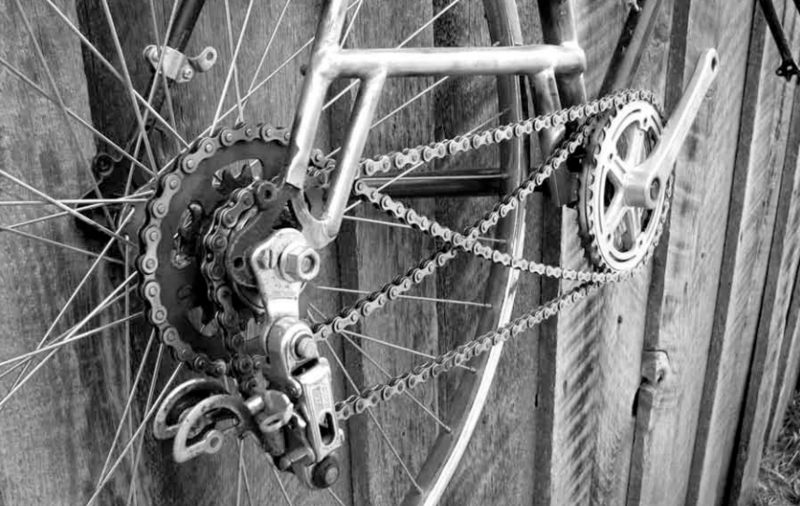 The chain loops over each freewheel through a tensioning device in a figure eight so that pedaling forward engages the high gear, and pedaling backwards engages the low gear (the converse is also possible). To change gears, the rider simply changes pedaling direction from forwards to backwards or vice versa. No shifters or cables are required. On a retro direct, one can coast forward without problem and can “shift” without the wheel ever having to stop. It really is two gears in one. Retro direct gearing was very popular through the 1920s. Proponents felt that pedaling backwards used different muscles, which helped to reduce fatigue. Retro direct gearing fell out of favor with the advent of the modern rear derailleur, which was a breakthrough at first, but decades later led to such monstrosities as the $409.99 eleven-speed cassette (think of the 1984 movie This is Spinal Tap, where brainless guitarist Nigel Tufnel proudly exclaims of his new amp, “This one goes up to eleven!”). I first became intrigued by retro direct gearing after reading about it in The Golden Age of Handbuilt Bicycles by Jan Heine, and later even built one up myself. Of course, I consulted a few others who had displayed their own modern retro direct creations on the internet either on Youtube.com or on blogs (see references below). Retro direct drives use two singlespeed freewheels, one small (high gear) and one large (low gear), mounted on the drive side of the rear hub. To change gears, the rider simply changes pedaling direction from forwards to backwards or vice versa. Brian Chapman of Providence, Rhode Island and Tyler Houck of rural northeastern Oregon live on opposite sides of the continent and have no knowledge of one another, but when I asked them each about retro direct gearing, what they said was eerily similar. Both had years of wrenching experience and even performed expert tasks such as frame building or frame repair. Both were inspired to build retro direct drives after reading about them in The Dancing Chain by Frank Berto. Both used the term “Frankenstein” to describe what amounts to a difficult, improvised build in which specific bicycle parts (such as BMX freewheels, pulleys robbed from old derailleurs, and metal non-drive side bottom bracket cups) are used beyond their intended purposes. Houck himself admits that it took three months of tinkering to work out all the glitches and bugs, but eventually produced a very reliable product, that dropped the chain only three times during over 2,000 miles of hilly riding. Chapman himself cautions that if the build is not performed properly, the chain can get caught between the two freewheels, bind, and cause the rider to crash. As of this writing, the number of retro direct bicycles currently in use on the planet is a mystery. Chapman is certain that no modern bicycle company has a production model retro direct bicycle. His own frame-building company, Circle A Cycles, produces custom singlespeed freewheels with as many as twenty-eight teeth for applications such as the low gear of a retro direct drive. Chapman admits, however, that so far they have sold only four. If motorists are inspired by seeing a retro direct drive in action, I imagine the cycling community would regard the idea with even higher esteem. More retro direct drives will be required on the street to fuel any sort of exponential expansion. In the interim, the retro direct drive seems destined to remain only a way for riders to show off their advanced wrenching skills. Assembling a Retro Direct Drive Train (Bicycle). Berto, Frank. The Dancing Chain: History and Development of the Derailleur Bicycle, 3rd Ed. 2009. Cycling Publishing, San Francisco, USA. Circle A Cycles, 523 Charles Street, Providence, Rhode Island, 02904. Heine, Jan. The Golden Age of Handbuilt Bicycles. 2009. Rizolli, New York, USA.